The 1853-O quarter represents an ideal opportunity for the variety specialist. It is much scarcer than the 1853 Philadelphia quarter, with less than one-tenth the mintage. It, along with the Philadelphia issue, represents a one-year type; a fact which keeps nice examples of either issue in demand and popular with many collectors. There are 5 die marriages of the 1853-O listed in The Comprehensive Encyclopedia of Liberty Seated Quarters by Larry Briggs (Lima, OH: ISBN 1-880731-05-3), with 5 more discovered since the book was published. And, despite the difficulty in attributing the obverse dies, all of which have a nearly identical date position, the mintmark and rays on the reverse facilitate attribution of the reverse dies. One of the most interesting of the known die pairs is the 1853 – O / Horizontal O. Though unknown when his book was published, the variety was discovered by Larry Briggs a short time later (1992, Gobrecht Journal Issue 58). The variety is rare, but not extremely rare. A number of lower grade examples remain unattributed and can be found with searching. The LSCC surveys in 1993 and 2007 reported a total of 2 and 5 examples of this variety in members’ hands, respectively, with only a single example reported in the 2007 survey graded as high as XF. No uncirculated specimens are known, but at least two certified AU examples exist. At present any example in VF or better has to be considered very rare. There is a single known die pair of the ’53-O/O, with neither die known in any other pairing. 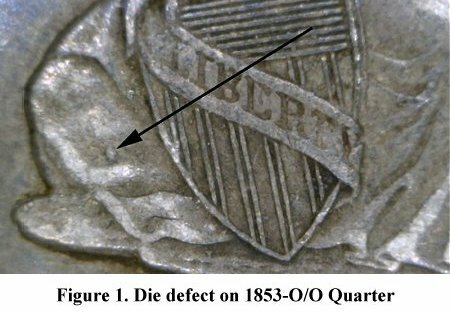 Attribution of the obverse die is difficult with low-grade coins, but there is an obvious diagnostic on high-grade examples. Figure 1 illustrates a die lump on the rock that is found only on the ’53-O/O obverse. 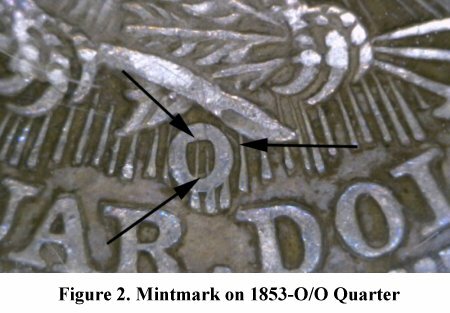 The most reliable method for attribution of the reverse is the mintmark itself (Figure 2). Lower grade coins, or those with debris filling the mintmark, can be attributed using mintmark position though it is challenging to do so.